When mass casualty incidents occur—shootings, earthquakes, multiple car pile ups—first responders can easily be overwhelmed by the sheer number of victims. When every second counts, monitoring all the victims in a chaotic situation can be difficult. 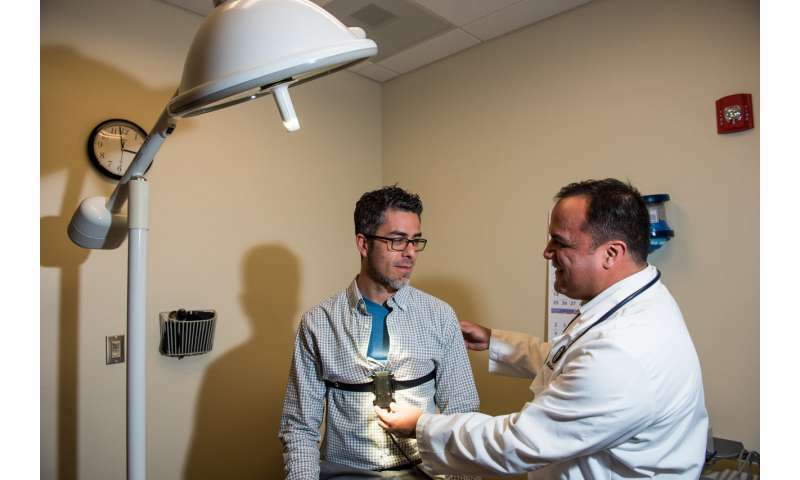 Researchers at the U.S. Department of Energy's Pacific Northwest National Laboratory developed a stick-on sensor that measures and tracks a patient's vital signs to help first responders quickly triage, treat and transport the injured. The patent-pending VitalTag is a low-cost suite of sensors that detects, monitors and wirelessly transmits vital signs, including blood pressure, heart rate, respiration rate and other metrics such as blood oxygen levels, shock index and data from a single-lead electrocardiogram. 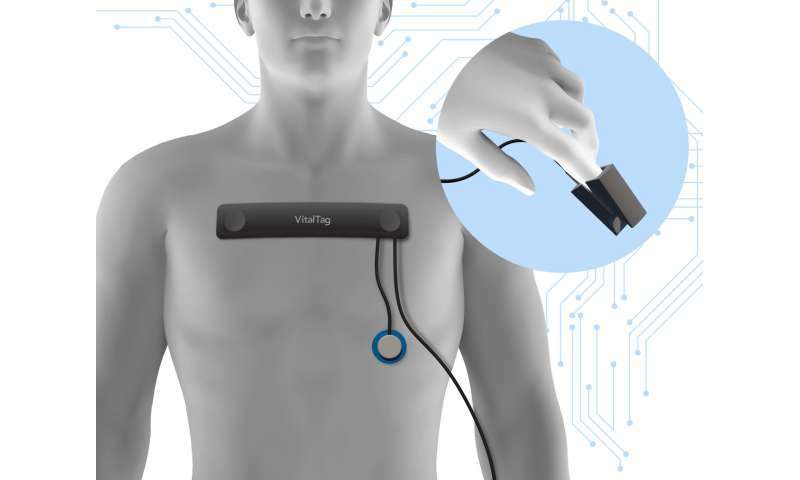 VitalTag adheres to a patient's sternum and connects seamlessly via Wi-Fi to securely transmit patient data to a mobile device or laptop in real time. Responders can view each patient's medical status and location on an incident map. And, should vital signs change for the worse, the system can also send an alert. This comprehensive view could enable emergency medical technicians and paramedics to tend to more patients faster, armed with more detail than ever before. VitalTag was developed as part of a broad Department of Homeland Security Science and Technology Directorate program called the Responder Technology Alliance. RTA, which is managed by PNNL, helps to advance the development of emerging technologies critical to the responder community. "First responders told us they need a device to continuously monitor patients in demanding environmental conditions," said Grant Tietje, a former first responder who manages RTA at PNNL. "VitalTag provides a wearable, cost-effective health monitoring solution." VitalTag consolidates expensive and bulky emergency response equipment into a wearable medical device that allows simultaneous monitoring of multiple patients, enhancing responders' situational awareness and improving resource management. PNNL data scientist Luke Gosink and his team worked to embed intelligence into the monitoring devices. They developed machine learning algorithms to interact with sensor hardware and created an intuitive user interface that helps first responder do more. "It is a resource multiplier," said Gosink. "Yes, ambulances have these types of equipment but usually only a few of each. With VitalTag, many more patients can be monitored simultaneously and continuously. More situational awareness, like that achieved with VitalTag, can result in better patient outcomes." PNNL is partnering with the occupational medicine company AnovaWorks to validate the efficacy of the prototype. AnovaWorks, which operates employer-based health care clinics including one at PNNL, will conduct a limited evaluation assessment to compare and evaluate whether measurements from the monitoring sticker are consistent with the readings taken in a clinical setting using standard medical devices. This is a fielded prototype technology that has not yet been approved by the FDA and is not commercially available. Details about the technology are available on the PNNL Available Technologies website or from PNNL's commercialization manager Kannan Krishnaswami.